Hollybeary Creations : Let's Light it up!!! 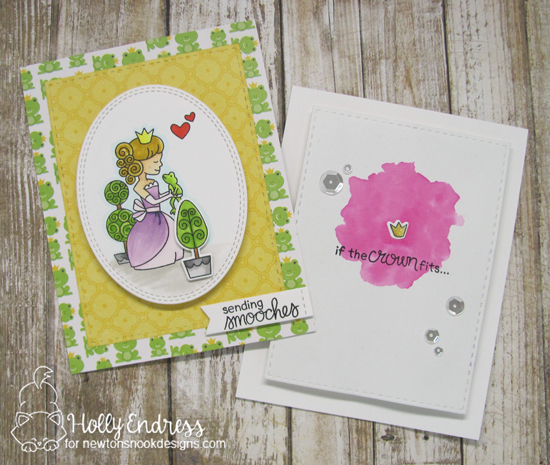 This week Newton's Nook Designs and Chibitronics are partnering for a fabulous inspiration week! All week long both design teams will be sharing ways to light up your cards using Chibi lights with Newton's Nook Designs stamps! 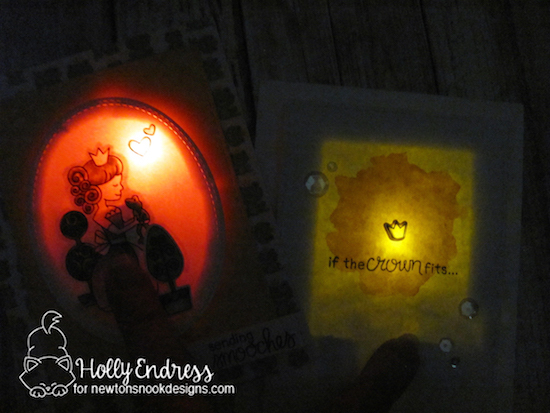 Today I created two projects using the Chibitronics and the new Once Upon a Princess set from Newton's Nook. My first card uses some Fun paper from Echo Park that pair with this stamp perfectly. I stamped the images onto a piece of White cardstock and colored them in with Copics. The tree in the front is die cut with the coordinating dies and popped up with foam tape. I have a Red Chibi light behind the hearts. This is my first time working with these Chibi lights... It took me a bit to get it but once I did I had so much fun creating and I have a million more ideas. The second card had a Watercolor wash in the background and I poked a hole in the center behind where the crown would be. I have the crown die cut and over the hole. This creates an extra layer of cardstock so that is why I added the hole. I wanted to make sure the Yellow light was very visible behind the crown. Here are the cards in the dark all lite up!!! Have you played with these Chibitronic Lights yet on your cards? Would you like to win a prize pack including a Starter Kit from Chibitronics and a $30 store credit to Newton’s Nook Designs? Leave a comment on the NND & Design Team blog posts using Chibitronics products all week (Aug 21-25) to enter. One winner will be randomly chosen from blog posts throughout the week so the more posts you leave comments on the better your chances are of winning! You have until Friday, August 25th at midnight CST to comment. The winner will be announced on the NND blog post on Monday, August 28th. Chibitronics will also be giving away a prize pack! Make sure to visit the Chibitronics blog each day this week for more inspiration and leave comments there for another chance to win! Beautiful cards, made extra special by adding the light up feature! Very pretty. I like the papers you used and that it lights up. Such sweet cards. I love how the crown lights up. Both of your cards are gorgeous and I love how you used the Chibi lights to give a wonderful look to the card. I haven't tried the Chibitronics yet, but would love to. Oh my goodness!!! Such magical cards!!! Any little girl would love to receive a sweet card like this. These lights make it extra-fun! Adorable cards! Fabulous coloring and paper choices on the first one, and I love how a small, single image can have so much impact on the second card. Both cards are really sweet and I love how you used the lights. Such cute cards!! Love the princess with the frog and the frog paper could not be more perfect. The lights just make them magical! The cards are lovely! The light up effect is so cool. These cards are both so awesome! I love how pretty they look in the dark! Thank you so much for being part of our fun inspiration week! Such a precious card, some little girl will love receiving that card.